NCCC sponsors a number of Club awards for members, non-members and for a variety of Contests. Purpose: To provide a means of rewarding NCCC members who are DX contesters, sprinters, VHFers, and especially active contesters. Time period: The contest year starts March 1. ARRL DX SSB is the first contest of the year. NAQP RTTY is the last. Eligible contests: See the rules for current list. Scoring: Score = number of contests in which you participated * sum of (points for each contest * each contest's multiplier). Note: NCCC weekly sprints are special. Points for the entire year are added up, but it is only counted as a single contest. Multi-ops: Points = total score divided by the number of operators. Station owners: A station owner who does not participate in a particular contest receives 25% of the points. Score Reporting: Only scores posted to 3830scores.com are counted. Awards: Only Paid NCCC members may receive awards. Brackets: There are four independent brackets for the purpose of awards: 1-Platinum, 2- Gold, 3-Silver, and 4-Bronze. Your bracket is assigned automatically at the beginning of the contest year according to your final position in the previous year’s standings. If you believe your current bracket is incorrect, please contact NA6O. 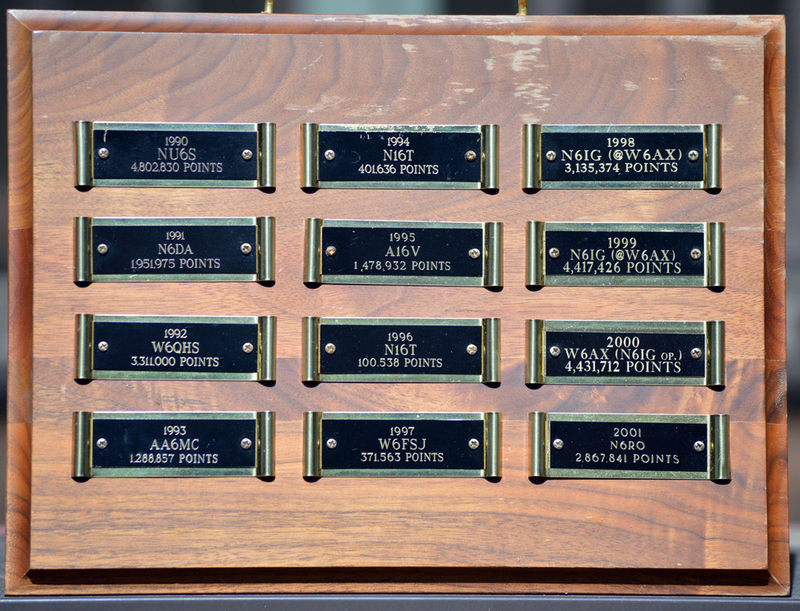 The 5 Meg award has generated a lot of interest since it started in July 1986. This award is intended to give recognition for sustained efforts by NCCC members. All too often club members compete with moderate stations, year-in and year-out without a reasonable chance actually to win major awards. The Five Million Point Award is designed to rectify this situation. This award is issued on a once-per-person basis. From time to time, the rules and standings will be published in the JUG. Any questions about the rules, or of any points totals should be addressed to Gary Johnson, NA6O. Each year 35 plaques are awarded to participants in the CQP contest. In addition, anyone submitting a log with 100 or more QSOs receives a personalized Certificate. Details can be found on the CQP website. 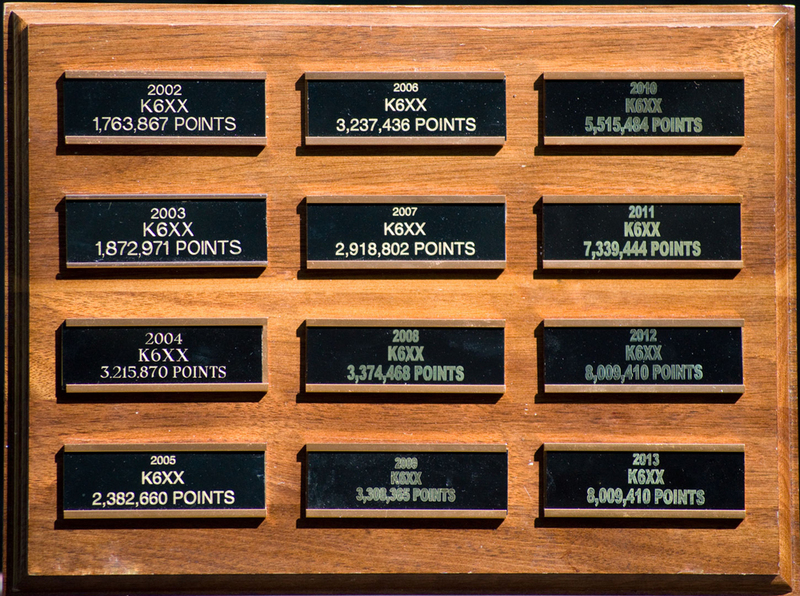 Each year a number of awards are given out for achievement during the annual ARRL November Sweepstakes contest. KB Awards - these are Individual awards, based on total SS QSOs (CW plus SSB). KB-1000, 2000, 2500, 3000, 4000, 5000, 6000, etc. = Inscribed Plaque for 1st time winner; Certificate afterwards. 400K Club Award - given to any Individual or Station producing at least 400,000 points in SS. Can be CW, SSB, or both modes. Big Gun Award - Individual award. Top SS point producer. Can be CW, SSB, or both modes. Little Gun Award - Individual award. Top SS point producer. QRP/LP. Not exceeding tribander + wires. Can be CW, SSB, or both modes. Gavel Bearer Award - Station award. Top SS point producer. Can be CW, SSB, or both modes. Jughead Award - QSOs with other NCCC members. Highest # or %. In memory of Jim Maxwell, W6CF, a plaque is awarded annually by the NCCC to the individual who has made the greatest contribution to the club's Sweepstakes effort. 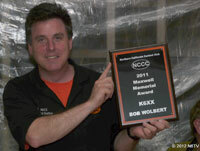 This award was sponsored by W6NL and K6BL for many years, but is now part of the NCCC annual awards program. 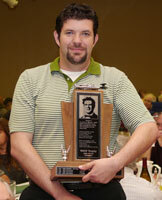 It is presented at the annual Awards Banquet in March. Note: Just for reference, there is another award honoring the memory of Jim Maxwell. It is not sponsored by NCCC, but is included here for completeness. 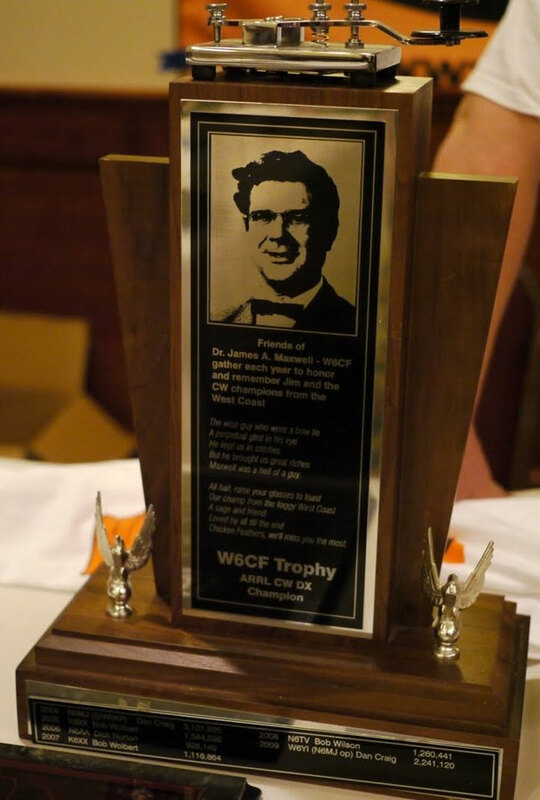 It's the Jim Maxwell Memorial Trophy awarded annually to the highest scoring single operator, operating unassisted, within the state of California, in the ARRL CW DX Contest. 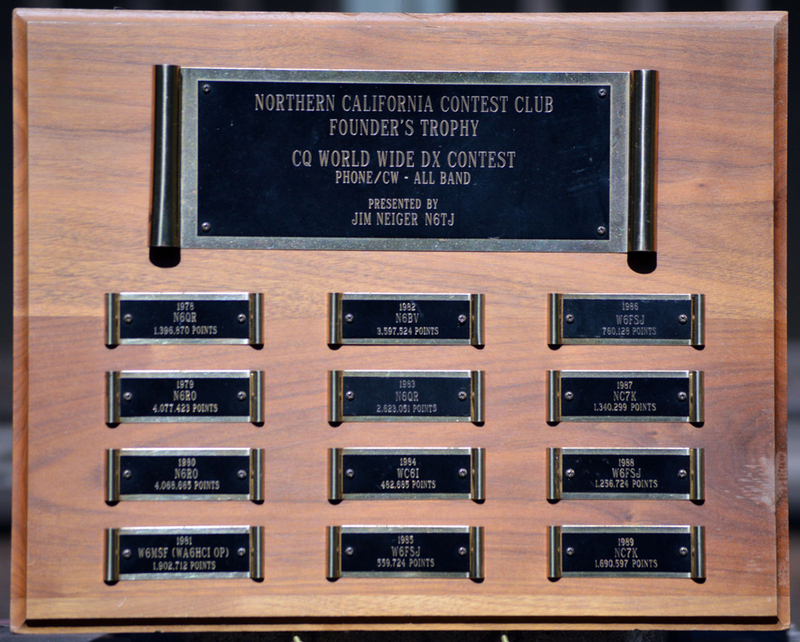 This large, beautiful trophy, originated by Jim Neiger, N6TJ, was first awarded in April 2005 at the IDXC meeting in Visalia. 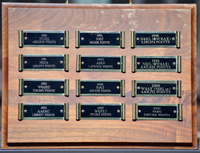 Each year since then a new winner is inscribed on the trophy base, as it changes hands. Founder's Award - In honor of NCCC Co-Founder Jim Neiger (N6TJ). Single Operator award for highest combined scores (CW + SSB) in CQ WW DX contest. The winner must be an NCCC member, inside the 175-mile club membership circle. K6RU Memorial Trophy - Honoring strong NCCC supporter Cam Pierce (K6RU). Station award for the Top Scoring California Multi-Multi station. Both modes needed (CW + SSB). NCCC sponsors the annual plaque for the Pacific Division, Single Operator High Power winner. NCCC sponsors the annual CQ WW DX RTTY Club Competition plaque. 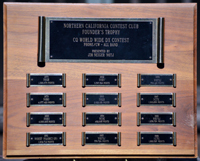 NCCC sponsors the annual plaque for the top California/Nevada score.